CD5 is a cluster of differentiation expressed on the surface of T cells (various species) and in a subset of murine B cells known as B-1a. The expression of this receptor in human B cells has been a controversial topic and up to date there is no consensus regarding the role of this receptor as a marker of human B cells. B-1 cells have limited diversity of their B-cell receptor due to their lack of the enzyme terminal deoxynucleotidyl transferase (TdT) and are potentially self-reactive. CD5 serves to mitigate activating signals from the BCR so that the B-1 cells can only be activated by very strong stimuli (such as bacterial proteins) and not by normal tissue proteins. CD5 was used as a T-cell marker until monoclonal antibodies against CD3 were developed. In humans, the gene is located on the long arm of chromosome 11. There is no confirmed ligand for CD5 but there is evidence that CD72, a C-type lectin, may be a ligand or that CD5 may be homophilic, binding CD5 on the surface of other cells. T cells express higher levels of CD5 than B cells. CD5 is upregulated on T cells upon strong activation. In the thymus, there is a correlation with CD5 expression and strength of the interaction of the T cell towards self-peptides. CD5 is a good immunohistochemical marker for T-cells, although not as sensitive as CD3. About 76% of T-cell neoplasms are reported to express CD5, and it is also found in chronic lymphocytic leukemia and mantle cell lymphoma cells. It is commonly lost in cutaneous T-cell lymphoma, and its absence can be used as an indicator of malignancy in this condition. The absence of CD5 in T cell acute lymphoblastic leukemia, while relatively rare, is associated with a poor prognosis. ↑ "Entrez Gene: CD5 CD5 molecule". ↑ Brown MH, Lacey E (Nov 15, 2010). "A ligand for CD5 is CD5". Journal of Immunology. doi:10.4049/jimmunol.0903823. PMID 20952682. ↑ Leong, Anthony S-Y; Cooper, Kumarason; Leong, F Joel W-M (2003). Manual of Diagnostic Cytology (2 ed.). Greenwich Medical Media, Ltd. pp. 67–68. ISBN 1-84110-100-1. Berland R, Wortis HH (2002). "Origins and functions of B-1 cells with notes on the role of CD5.". Annu. Rev. Immunol. 20: 253–300. doi:10.1146/annurev.immunol.20.100301.064833. PMID 11861604. Osman N, Ley SC, Crumpton MJ (1992). "Evidence for an association between the T cell receptor/CD3 antigen complex and the CD5 antigen in human T lymphocytes.". Eur. J. Immunol. 22 (11): 2995–3000. doi:10.1002/eji.1830221135. PMID 1385158. Van de Velde H, von Hoegen I, Luo W, Parnes JR, Thielemans K (1991). "The B-cell surface protein CD72/Lyb-2 is the ligand for CD5.". Nature. 351 (6328): 662–5. doi:10.1038/351662a0. PMID 1711157. Jones NH, Clabby ML, Dialynas DP, Huang HJ, Herzenberg LA, Strominger JL (1986). "Isolation of complementary DNA clones encoding the human lymphocyte glycoprotein T1/Leu-1.". Nature. 323 (6086): 346–9. doi:10.1038/323346a0. PMID 3093892. Lankester AC, van Schijndel GM, Cordell JL, van Noesel CJ, van Lier RA (1994). "CD5 is associated with the human B cell antigen receptor complex.". Eur. J. Immunol. 24 (4): 812–6. doi:10.1002/eji.1830240406. PMID 7512031. Raab M, Yamamoto M, Rudd CE (1994). "The T-cell antigen CD5 acts as a receptor and substrate for the protein-tyrosine kinase p56lck.". Mol. Cell. Biol. 14 (5): 2862–70. PMC 358654 . PMID 7513045. Dianzani U, Bragardo M, Buonfiglio D, Redoglia V, Funaro A, Portoles P, Rojo J, Malavasi F, Pileri A (1995). "Modulation of CD4 lateral interaction with lymphocyte surface molecules induced by HIV-1 gp120.". Eur. J. Immunol. 25 (5): 1306–11. doi:10.1002/eji.1830250526. PMID 7539755. Van de Velde H, Thielemans K (1996). "Native soluble CD5 delivers a costimulatory signal to resting human B lymphocytes.". Cell. Immunol. 172 (1): 84–91. doi:10.1006/cimm.1996.0218. PMID 8806810. Dennehy KM, Broszeit R, Garnett D, Durrheim GA, Spruyt LL, Beyers AD (1997). "Thymocyte activation induces the association of phosphatidylinositol 3-kinase and pp120 with CD5.". Eur. J. Immunol. 27 (3): 679–86. doi:10.1002/eji.1830270316. PMID 9079809. Gary-Gouy H, Lang V, Sarun S, Boumsell L, Bismuth G (1997). "In vivo association of CD5 with tyrosine-phosphorylated ZAP-70 and p21 phospho-zeta molecules in human CD3+ thymocytes.". J. Immunol. 159 (8): 3739–47. PMID 9378960. Dennehy KM, Broszeit R, Ferris WF, Beyers AD (1998). "Thymocyte activation induces the association of the proto-oncoprotein c-cbl and ras GTPase-activating protein with CD5.". Eur. J. Immunol. 28 (5): 1617–25. doi:10.1002/(SICI)1521-4141(199805)28:05<1617::AID-IMMU1617>3.0.CO;2-7. PMID 9603468. Bauch A, Campbell KS, Reth M (1998). "Interaction of the CD5 cytoplasmic domain with the Ca2+/calmodulin-dependent kinase IIdelta.". Eur. J. Immunol. 28 (7): 2167–77. doi:10.1002/(SICI)1521-4141(199807)28:07<2167::AID-IMMU2167>3.0.CO;2-L. PMID 9692886. Calvo J, Vildà JM, Places L, Simarro M, Padilla O, Andreu D, Campbell KS, Aussel C, Lozano F (1998). "Human CD5 signaling and constitutive phosphorylation of C-terminal serine residues by casein kinase II.". J. Immunol. 161 (11): 6022–9. PMID 9834084. McAlister MS, Davis B, Pfuhl M, Driscoll PC (1999). "NMR analysis of the N-terminal SRCR domain of human CD5: engineering of a glycoprotein for superior characteristics in NMR experiments.". Protein Eng. 11 (10): 847–53. doi:10.1093/protein/11.10.847. PMID 9862202. Perez-Villar JJ, Whitney GS, Bowen MA, Hewgill DH, Aruffo AA, Kanner SB (1999). "CD5 negatively regulates the T-cell antigen receptor signal transduction pathway: involvement of SH2-containing phosphotyrosine phosphatase SHP-1.". Mol. Cell. Biol. 19 (4): 2903–12. PMC 84084 . PMID 10082557. Carmo AM, Castro MA, Arosa FA (1999). "CD2 and CD3 associate independently with CD5 and differentially regulate signaling through CD5 in Jurkat T cells.". J. Immunol. 163 (8): 4238–45. PMID 10510361. Vilà JM, Calvo J, Places L, Padilla O, Arman M, Gimferrer I, Aussel C, Vives J, Lozano F (2001). "Role of two conserved cytoplasmic threonine residues (T410 and T412) in CD5 signaling.". J. Immunol. 166 (1): 396–402. doi:10.4049/jimmunol.166.1.396. PMID 11123317. Vilà JM, Gimferrer I, Padilla O, Arman M, Places L, Simarro M, Vives J, Lozano F (2001). 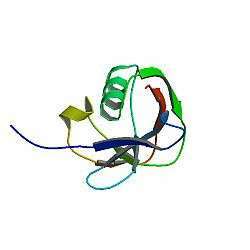 "Residues Y429 and Y463 of the human CD5 are targeted by protein tyrosine kinases.". Eur. J. Immunol. 31 (4): 1191–8. doi:10.1002/1521-4141(200104)31:4<1191::AID-IMMU1191>3.0.CO;2-H. PMID 11298344. Kirchgessner H, Dietrich J, Scherer J, Isomäki P, Korinek V, Hilgert I, Bruyns E, Leo A, Cope AP, Schraven B (2001). "The transmembrane adaptor protein TRIM regulates T cell receptor (TCR) expression and TCR-mediated signaling via an association with the TCR zeta chain.". J. Exp. Med. 193 (11): 1269–84. doi:10.1084/jem.193.11.1269. PMC 2193385 . PMID 11390434. Gary-Gouy H, Harriague J, Dalloul A, Donnadieu E, Bismuth G (2002). "CD5-negative regulation of B cell receptor signaling pathways originates from tyrosine residue Y429 outside an immunoreceptor tyrosine-based inhibitory motif.". J. Immunol. 168 (1): 232–9. doi:10.4049/jimmunol.168.1.232. PMID 11751967. Mier-Aguilar CA, Vega-Baray B, Burgueño-Bucio E, Lozano F, García-Zepeda EA, Raman C, Soldevila G (2015). "Functional requirement of tyrosine residue 429 within CD5 cytoplasmic domain for regulation of T cell activation and survival.". Biochem Biophys Res Commun. 466 (3): 381–7. doi:10.1016/j.bbrc.2015.09.033. PMID 26363459.